The Institute of Company Secretaries of India is celebrating its golden jubilee. To mark the occasion, a golden jubilee celebration is being organized at Vigyan Bhawan which will be inaugurated by Prime Minister Narendra Modi. New Delhi: The Institute of Company Secretaries of India is celebrating its golden jubilee. To mark the occasion, a golden jubilee celebration is being organized at Vigyan Bhawan which will be inaugurated by Prime Minister Narendra Modi. The event will also be telecasted on Doordarshan (DD) channel on October 4, 2017 at 6:00 pm. The Institute of Company Secretaries of India is the only recognized professional body in India to develop and regulate the profession of Company Secretaries in India. ICSI has its its headquarters at New Delhi, four Regional Offices at New Delhi, Chennai, Kolkata, Mumbai and 69 Chapters across India. The Golden Jubilee celebration will be inaugurated by the Prime Minister Shri Narendra Modi. The ceremony will be held at Vigyan Bhawan. At the event ICSI will also felicitate most distinguished and high profile 50 Members. At the event, member concerned will be required to produce the Original invitation card (with envelope on which their communication address is pasted) along with their original Aadhar Card/ PAN Card at the designated Entry Gate of Vigyan Bhawan for necessary verification, before entering in the specified hall. The entry shall start at 2.00 pm and will close at 3.30 pm. The members are expected to be seated in respective hall by 3.45 pm. The dress code for male members is white/off white kurta pazama and for female members is white/off white suit or saree. 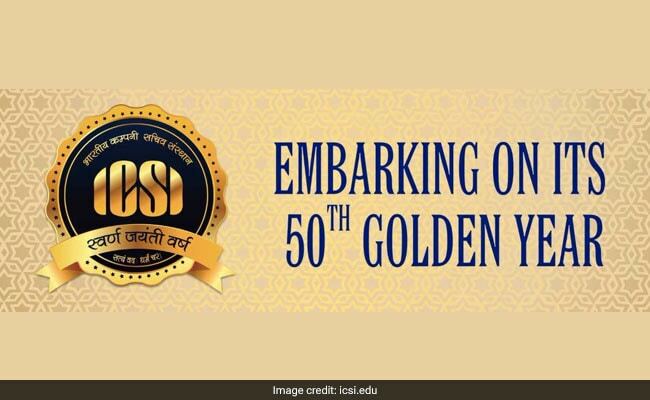 To mark the occasion, students and alumni of ICSI have also taken to using a special frame for their Facebook profile pictures which proudly announce the golden jubilee year of ICSI. At present there are almost 50,000 members of the Institute and more than 4,00,000 students are enrolled with the institute.